Dog Pound Dollars Video Slot Guide & Review - Casino Answers! Dog Pound Dollars is a 5-reel, 15-line video slot from Rival, featuring wild symbols, scatter wins, multipliers and a free spins feature. You can play the Dog Pound Dollars video slot at Bovada. 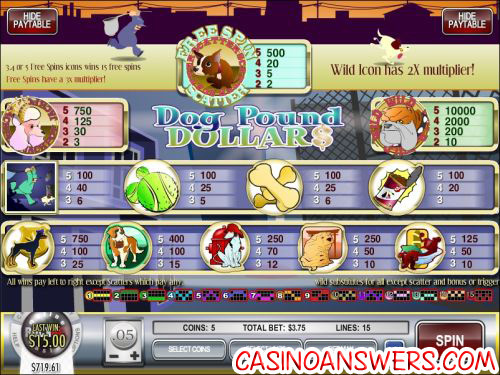 Dog Pound Dollars (or simply “Dog Pound”) is a great video slot for animal lovers and pet owners alike. Of course, it features dogs and lots of them. Of the breeds featured, you’ve got the Chihuahua (scatter symbol), Bulldog (wild symbol), Poodle, Dobermann, St. Bernard, Dalmation, Shar Pei and Daschund. Other symbols on the Dog Pound slot are the Dog Catcher, Tennis Balls, Dog Bones and Dog Food. When you get a winning combination on the Dog Pound slot machine, you will hear a drumbeat and on some of the symbols, the symbol will become animated. Before you get started on the Dog Pound video slot, you will want to set your wager. Coin sizes start at $0.01 and also include $0.05, $0.10, $0.25, $0.50 and $1. Next, set the number of coins you wish to play (up to 5) and the number of active paylines (up to 15). The lowest total bet on the Dog Pound Dollars slot game is $0.01 per spin. The highest total bet is $75 per spin. To play the maximum coins and paylines, use the “Bet Max” button. To play the Dog Pound slot machine with your own wagering settings, use the “Spin” button to play. Autoplay is available for real money players. The top jackpot on the Dog Pound slot game is the Bulldog symbol. 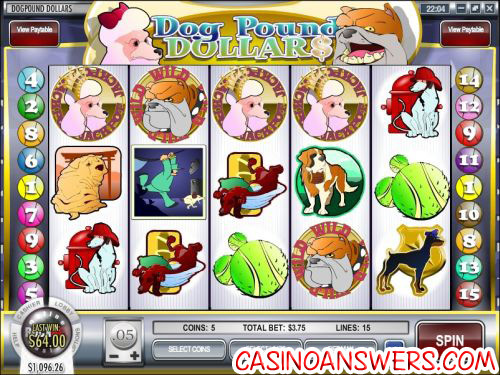 To win the 10,000 coin top jackpot on Dog Pound Dollars, you must get 5 Bulldog symbols on a selected payline. Also, the Bulldog symbol is wild and will substitute for all symbols except for the Chihuahua scatter symbol. It also acts as a 2X multiplier to double your winnings. Win this top payout by playing the Dog Pound online slot at Bovada! The scatter symbol on the Dog Pound video slot is the Chihuahua symbol. It will pay 2X your total bet for 2 symbols (which isn’t bad to begin with), but if you hit 5 Chihuahua symbols anywhere on the reels of Dog Pound Dollars, you can win up to 500X your total bet. Hit 3 or more Scattered Chihuahua symbols and you will win 15 free spins with a 3X multiplier! If you want to see if the Dog Pound slot’s bite is anything like its bark, you can try Dog Pound out at a Rival-powered online casino such as Bovada. Are USA players able to play the Dog Pound video slot? Where can I play a Flash version of the Dog Pound casino game for free? Both Pantasia Flash Casino and Slots Jackpot Flash Casino offer an Instant Play version of Dog Pound Dollars using Flash. If you experience any issues with the Flash slot game, make sure you have the latest version of Adobe Flash Player installed on your computer. Where can I get a free cash bonus to play Dog Pound? If the $15 free no deposit bonus from Pantasia Casino is not enough for you, Casino Answers offers an exclusive $100 no deposit bonus when you sign up at Rockbet Casino. What rival slot machines are there?